Nashville fire pit stone and block fire pit page. We are the people to call when you want to have a fire pit installed in the Nashville TN area. Two Videos below of our fire pit projects. We make some of the most beautiful. Fire Pits in Nashville. You can choose from a Gas Fire Pit or a Wood Burning Fire Pit. All of our work is guaranteed for 1 year. ( Custom Stonework ) We make natural stone, man made stone, and paver fire pits. We use fire brick in the center of our pits to protect your stone from the heat. Take a look below. 5′ Circular Fire Pit with Thin Cap. Quigleys Landscaping and Hardscapes Contact us. For all of your Fire Pit Needs! This fire pit is in Brentwood Tn. Spend the evening roasting marshmallows or just entertaining friends around the fire. 3′ 6″ Circular Fire Pit with 1 1/2″ Thick Cap. This fire pit above is in Nashville and it is one of our smaller ones. Gray on Gray flagstone fire pit. 3′ Circular Fire Pit with Rustic Pieces. Gas Firepit above with black lava in the center we can also add sparkling fire glass. The above fire pit is gas and has smaller pieces of flagstone used for the cap, what a great look! 4′ Circular Fire Pit with 1 1/2″ Thick Cap. For all of your Tan Flagstone Fire Pit Needs! This Tan Flagstone Fire Pit has a firbrick center and has flagstone mortared to the outer edge. The beautiful cap is made of large flat pieces cut to size. Call us today for your Nashville Flagstone Fire Pit. 4′ Circular Tan Craborchard Fire Pit with 1 1/2″ Thick Cap. For all of your Tan Natural Flagstone Firepit Needs! 4′ Circular Tan Flagstone Fire Pit with Thin Cap. Our fire pits are made with fire brick inside to protect the natural stone from heat. A fire pit made with natural stone is timeless and affordable when compared to concrete block. 4′ Circular Block Fire Pit with Steak Grill Insert on Pavers. This is our least expensive option and also a nice choice. This fire pit does not have a firebrick center. Great for any back yard. This is a Gray and Tan fire pit. 4′ Circular Block Fire Pit with Steak Grill Insert on Flagstone. This is a 10′ x 10′ circular patio with flagstone set in pea gravel with Gray firepit with Grill. 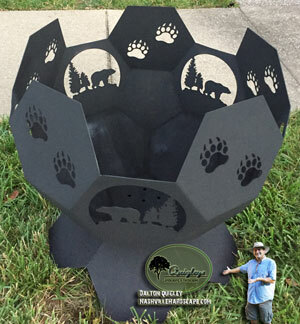 See our total collection of octagon themed fire pits here – Iron fire pits. We also have two sizes in Iron Fire Pits. The one you see here is the small. This is the second iron fire pit we sell and it is the large. Now we want you to Contact us. Smoking hot popular fire pits, fireplaces, and even with gas fire pits are smoking hot. Well, when they’re being used, fire pits are quite hot indeed. But the fad of having a fire pit in your yard is just as hot – the number of people shopping for fire pits and adding them to their yard as a landscaping feature has increased enormously just in the past five years. Many people want a fire pit for entertainment purposes – it’s nice to gather around a safe, controlled fire outdoors, but still within reach of the kitchen. But don’t install that fire pit too close to the kitchen. 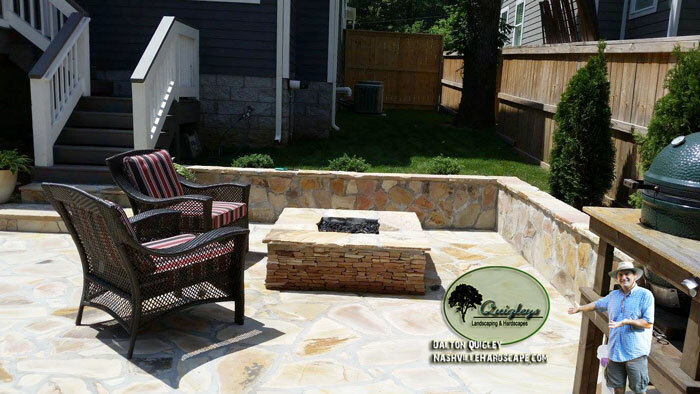 A fire pit should be placed on a satellite patio and made from materials like stone or concrete that can with-stand heat, which is dedicated to the fire pit itself, at least 15 feet away from the house according to Nashville Firepit Regulations.